CREATES will hold eight events during its grant period. Four of these are ‘Learning, Teaching, and Training Activities,’ two of which will host higher education learners and two of which will host higher education instructors. These are held roughly midway through the project (2019) in order to gather feedback from and share ideas with students and instructors, the people who stand to gain the most from the development of practical educational and advising toolkits. Four events are ‘Multiplier Events,’ held near the end of the CREATES funding period (spring 2020). These target institutions and educational leaders other than the six CREATES partners to disseminate the information and innovation generated by the CREATES development teams and to raise awareness of the toolkits. CREATES first student exchange and training event was held on July 10-14, 2018 at University College Freiburg. 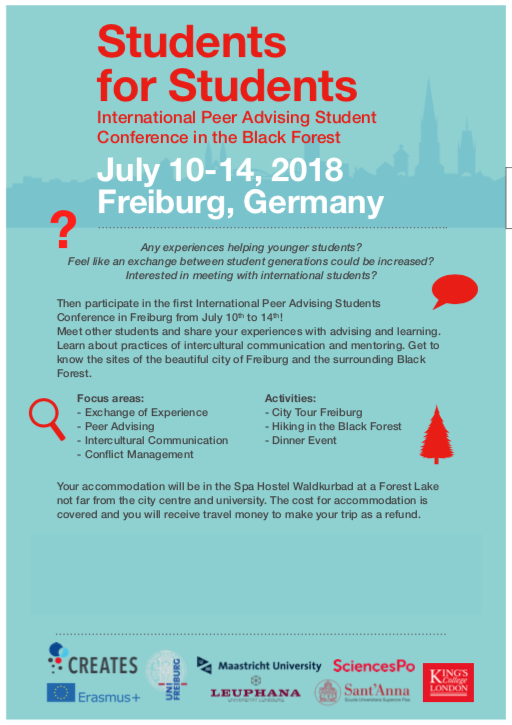 We were pleased to invite 3-4 students from each partner university to participate in the “Students for Students International Peer Advising Student Conference in the Black Forest” to share ideas and advance our joint work on peer advising. The focus of the student workshop was be an exchange of needs and experiences concerning peer advising among international students. Furthermore, it will included training sessions with a focus on intercultural mentoring and conflict resolution. As part of Toolkit 3, the workshop was designed for students from a variety of curricular backgrounds with the objective of elaborating with and introducing them to the practice of peer-advising and working with other students for their academic and professional development. Organized as a ‘think tank’ style learning event, the second five-day workshop for students will focus on the practice of faculty advising, peer advising and self-advising. Supported by staff at the University College Maastricht, students from all six partner institutions will engage with specific prompts formulated by the three CREATES development teams working on advising-focused toolkits. The event will culminate in the co-creation of innovative, student-centered solutions for advising in higher education. Further ideas and feedback will be incorporated into Toolkits 2, 3 and 4. The event will specifically focus on the types of courses to which the techniques are suited, the learning goals and outcomes supported by the techniques, and on offering concrete examples and sample materials demonstrating the approaches. During this three-day training event, instructors from UCM, Leuphana and UCF will introduce two participants from each partner institution to the faculty advising toolkit, also offering them the opportunity to apply what they have learned by advising each other in recorded face-to-face sessions. An important aim is to prepare participants to assume the role of coaches who will introduce faculty to the innovative approaches to faculty advising represented in the toolkit. Moreover, participants will be asked to reflect on what they have learned and provide both open feedback and a structured evaluation of the techniques. This feedback will be used by development team to finalize the materials in Toolkit 2. The two-day event will address decision-makers at higher education institutions in Europe and advocate the implementation of a responsive and engaged approach to learning. It will be an opportunity to specify the societal demand for this approach; develop the major justifications for it; outline its major principles and features; present evidence for its feasibility (based on the experiences at the partner institutions and the tools development). Special room will be given for discussing the challenges that this approach raises. The two-day conference is dedicated to new orientations in teaching and learning, bringing together about 60 participants from European higher education institutions. The conference will have parallel panels on different aspects of module design and will feature impact talks from partner institutions; tools- and practice- based workshops as well as roundtable discussions on key issues. The two-day conference will be dedicated to strategies for opening up curricula to student choice and supporting student development through impactful advising. It will bring together 50 representatives from European higher education institutions to present CREATES toolkits and results and to discuss both trends in curricula and innovations in advising. The one-day seminar for policy makers and stakeholders (25 participants) from within and outside higher education will bring together different perspectives on the relevance of co-creation in higher education and discussing CREATES’s policy recommendations. It will concretely focus on how the toolkits and insights produced by the partners can be implemented throughout the higher education sector.